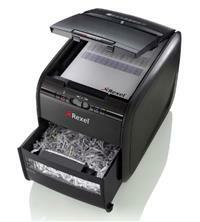 The Rexel Auto+ 60X Cross-Cut Shredder is part of Rexel’s award winning auto+ shredder range. No need to feed pages in manually - simply open the lid, stack your paper for shredding, close the lid and let it automatically shred! Capable of shredding up to 60 sheets of 80gsm paper at a time (or 65 sheets of 70gsm), this 60X version is ideally suited to personal home shredding. Each piece of A4 paper is shredded into approximately 200 4x45mm cross cut pieces, giving this shredder a P-3 DIN security rating (great for shredding confidential documents). To make life even easier the Rexel Autoplus 60X will also get through staples and paperclips, so no need to bother removing these before shredding. It will even shred credit cards too. The 15 litre bin is an easy to empty pull out style and also has a viewing window so you can see when it needs emptying. Other features include: a manual feed slot to shred up to 5 sheets; easy to use controls; a cool down indicator; a manual reverse function; and quiet operation of less than 60dBA. A manufacturer’s warranty covers the Rexel Auto+ 60X for 2 years on the machine and 5 years on the cutting blades.